Sometimes a verse just kicks you in the teeth. It hits you hard and knocks you to the ground and sometimes it kicks you in the teeth, breaks your heart, and then mends pieces you didn’t know were broken. Psalms 27:14 has made me mad, encouraged me, scared me, and then changed my view of God in a completely different way than I ever expected. I’m reading through the Psalms right now and I guess I just passed right by 27:14 and it just wasn’t the right time for it to stick or be used in my heart. I am currently on Psalms 119, and on a side note let me just say you need to read it! So good! Anyway, I passed Psalms 27 awhile ago and it didn’t hit me then. But a few days ago I was reading a blog over at Sacred Ground, Sticky Floors, which I HIGHLY recommend and Jami used this verse. I don’t even remember the context, but immediately it HIT ME. I opened my bible app on my phone and looked up Psalms 27 and I remembered reading it a couple weeks months ago (I’m on the read your bible in three years plan), thinking how did I miss this verse. Guys, I find myself in an extremely slow and also very fast time of waiting. I don’t know how else to say that, besides that I feel I am constantly in a state of waiting, yet what I am waiting for is right around the corner. It’s a strange feeling, a feeling of deep deep longing and at the same time an anxiety for what is to come. And in this paradox of emotions, God inserts Psalms 27:14. It just stuck, without any effort and played on repeat in my brain. My first-ish thought was GREAT, I’m not getting an answer anytime soon. Perfect. Thanks a lot. (I know… my thoughts are SUPER godly). God clearly wants me to trust Him and wait, which let’s be honest I wasn’t thrilled about. Then it encouraged me, built me up, and empowered me! Yes, Lord I will trust you! You’ve got this! Your way is better than mine and you know what is best. I WILL be strong and courageous. Next came the fear…my kryptonite. Fear rips through my mind, like nothing else. It twists my thoughts and brings doubt and the worst of the worst case scenarios into my heart. It changes a loving God who cares personally for me into an omnipotent deity that will do the worst TO me in order to accomplish His will. Clearly not a good place to be, especially in this state of waiting. In true Psalms fashion, I did not stay in that horrible state of fear. 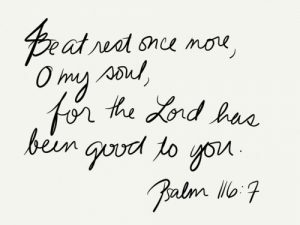 The Lord swiftly used Psalms 116:7 to remind me of His true nature and my propensity to sway towards that which is terribly negative. I love the gentle rebukes He sends us to bring our hearts back to Him. Today, Psalms 27:14 changed my view of God, in a much more positive way and hopefully much more permanent way. I started thinking less about the call to wait and more about the “be strong and let your heart take courage” part. 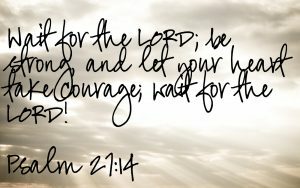 God believes that I need to be strong and that my heart needs courage to get through this difficult waiting period. I realized at that moment that I believe God to be up in Heaven shaking His head at me and muttering, “Why can’t she get this right?!!?! I’m God, HELLO BaCall, trust me already!” The God in my head is irritated with my lack of trust, with my inability to get it together already. He’s grumpy with me. BUT does a grumpy, irritated God encourage you with, be strong, take courage? No, the answer is no! I have this personal loving God, who gently tells me it’s really hard, BaCall, I understand more than you can ever imagine. I just need you to be strong right now, let your heart have the courage to trust me and wait. Believe me, it takes courage to do that, but rely on me and I will give you the strength to do it. That’s the God we have! The loving, encouraging, and slow to anger God that sent His son to save me, not the God grumpy, irritable god that lives in my head when fear and doubt take over.